In 1984, a new client (whom some readers will know as Melanie Wilson) called to say she was smitten. 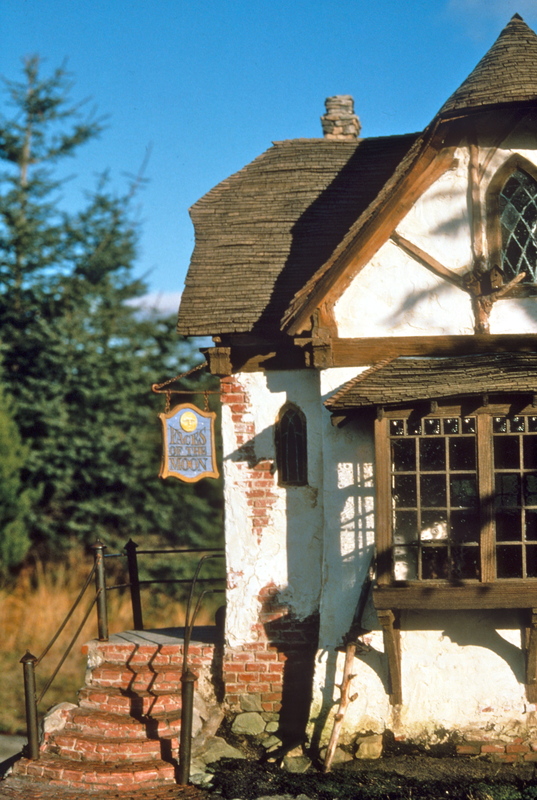 She had just seen the newly-completed Pippen Hill–our semi-fantasy Old European toymaker’s workshop inspired by the paintings of Anton Pieck–and asked if we would build her something similar. Having just finished the project, we weren’t sure we wanted to, or were even capable of inventing another fairytale structure with unknown materials. However, as such things go, the three of us clicked right away—Melanie is one of those people with an irresistible spark that is impossible to turn away from. Luckily, we had a waiting list and could put the idea on the back burner while we worked on other projects. We went our separate ways, but the idea of working with her on a fantasy project simmered along in our minds like a be-ribboned package left on the doorstep. Melanie is a dreamer with a great imagination. One dream involved an ageless toymaker with a modest but comfortable place in which to work, sell his toys, and live. She knew what she liked and was able to verbalize it. She also knew she liked what our minds did with architecture. Together the three of us entered into an unspoken contract in which she would trust us enough to produce the best piece of work we could, and we trusted her to embrace our aesthetic choices. And to wait. For the next eight years, a string of other commissions took over, but as we worked, our thoughts strayed to what the new toymaker’s shop might look like. Neither Noel nor I think sequentially—I’d think about what we’d name it, what its secrets would be, and, practically, what we’d do for a roof–the slates we’d used on Pippen Hill were no longer available, and were way to much work even if they were—maybe thatch, but no, I hadn’t seen any I thought was successful. I don’t know what Noel was thinking, but every now and then he’d say something like, “Twig furniture. ” “It could be a story and a half with a cellar,” or, “We could do a stone chimney,” and I’d know what he was talking about. Mail arrived, and there would be a photo from Melanie—some architectural detail she’d seen that might make our hearts beat faster. One was of a house in Carmel, CA with a wave-coursed roof—narrow rows of fluctuating courses of wooden shingles. Wonky, complex, and romantic, it seemed perfect for the building, and we already had miniature shingles enough for a lifetime. Once, it was a Disney drawing of Gepetto’s workshop. And, most memorably, she sent a small silver charm—it looked like a mask of a grumpy man in the moon. She said she didn’t know why she sent it, but thought it might help. It sat on the table like an enigma, a charm in the sense of a spell, a totem, or mojo. Mr. Moon looked like the dark side of a fairy tale, the other side of Gepetto. 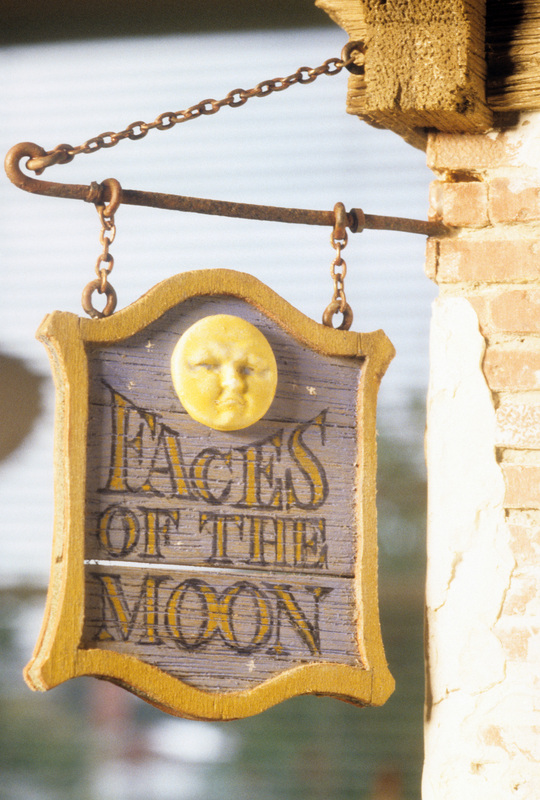 It came to us one morning at breakfast, the name of the project—Faces of the Moon. So, we had a roof, Gepetto, and the Moon, there was no turning back. This entry was posted in Houses, Miniatures, People and tagged Carmel, dollhouses, Faces of the Moon, fantasy architecture, Gepetto, miniatures. Bookmark the permalink. You two are amazing! I love your work and your writting. I am a long time admirer. Always waiting for your next article and a view of your magnificant creations. Oh no, this has just given me an inspiration for another project – I’ll have to retire first though! This is such a great story. Can’t wait for the rest.